Starring Anton Yelchin, Lucie Lucas, Paulo Calatré, Françoise Lebrun, Florie Auclerc-Vialens, Diana de Sousa, Rita Pinheiro, Aude Pépin, Leonor Brunner, Leonor Cordes and Naga. Screenplay by Larry Gross and Gabe Klinger. Distributed by Kino Lorber. 76 minutes. Not Rated. It is hard to watch Porto as a film without the whole movie being covered by a sad pall of what might have been. This will one of the final films by co-lead Anton Yelchin, who died in his twenties last year due to an exceedingly unnecessary and tragic accident. There are three other films he was working on when he died, but only Thoroughbreds is definitely planned for release. Yelchin started as a child actor – I first remember seeing him in Hearts of Atlantis opposite Anthony Hopkins back in 2001. Since then he had become an indie favorite – with the occasional odd blockbuster peppered in – a smart and subtle actor. In fact, honestly, occasionally a bit too subtle. He tended to downplay almost everything. This is particularly a problem because, even though there are several characters here, Porto is essentially a two-person story. 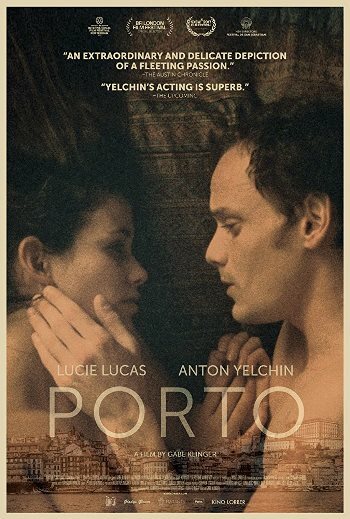 Porto tells the story of a passionate one-night stand – between a twenty-something American drifter and a drop-dead gorgeous, but kind of neurotic Portuguese woman – and how that night affects the two over the next several years. The film is cut into three sections, one tells us the story from the man’s point of view, one from the woman’s point of view, then an imperfect melding of the two stories. Therefore, we see certain scenes over and over, with little details added each time. It flips back and forth in time, giving the audience a deeper understanding of little throwaway moments early on. It is gorgeous and moody and very, very arty. Unfortunately, there is one rather serious problem with the story of Porto. I’m not sure the audience ever really sees what she sees in him. Jake (Yelchin) is balding, unfashionable, twitchy, introverted, needy, essentially homeless and borders on stalkerish sometimes. He even gets violent, hitting her in one flashback scene. Despite the fact that Mati (played by popular French TV actress Lucie Lucas) freely acknowledges she spent some time in a mental facility, she is spectacularly attractive, smart, funny, charismatic, has a boyfriend and a spectacular new apartment overlooking the Porto River. Something is obviously missing in her life, but is he really the answer? So why is she hanging around with him? Of course, no one can explain the mysteries of love or even attraction. Sometimes it’s just a spontaneous combustion. However, the fact that we are questioning their compatibility, while partly the point of the film, still works to its disadvantage. It’s not enough that they are an odd fit, we just never quite buy into the strong connection – more on his side than hers, but she continues musing about this weird guy from her past years later when she is a divorced mother. Tags: Anton Yelchin, Aude Pépin, Diana de Sousa, Florie Auclerc-Vialens, Françoise Lebrun, Gabe Klinger, jay s jacobs, Larry Gross, Leonor Brunner, Leonor Cordes, Lucie Lucas, movie review, Naga, one-night stand, Paulo Calatré, PopEntertainment.com, Porto, Portugal, posthumous, Rita Pinheiro. Bookmark the permalink.